Our friend, filmmaker and racer Alex King, sent us this very special recollection to share with you tracktards. It's a snapshot of a simpler, perhaps happier time in racing. Even though the clip below is precisely what you would expect from a 1970's production (yes, there is some jazz flute...), I urge you to watch the whole thing, I promise you will enjoy it. When my mom passed away in from cancer in late 2008, my dad uncovered this old film of them racing Formula Atlantic in the 1970s, in the golden days, when some of the best racers started and competed in that series. Brack, Villeneuve, and even Hunt, Brambilla, Patrese, Lafitte and Pironi competed at a famous race at Trois Riveres . 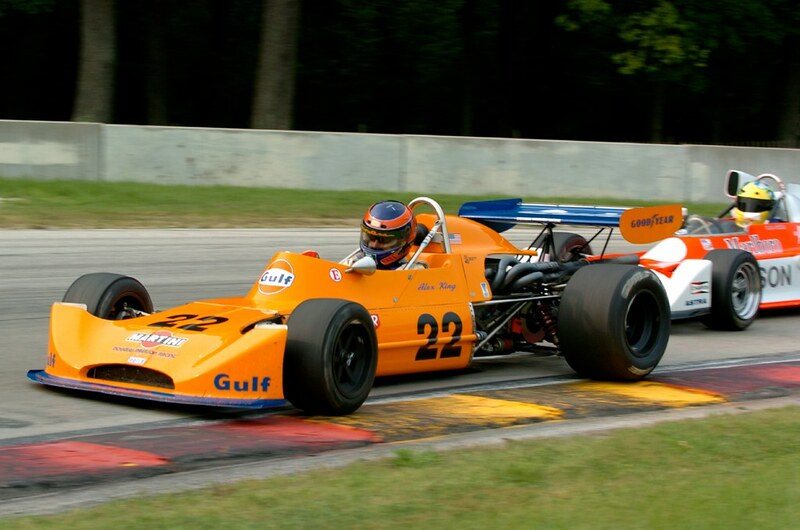 In 2004, I raced at the revival event there in his very own '73 March. I fought Duncan Dayton only retire from the lead with a tightening up motor. It's a cool little video that is almost a preface to vintage racing these days. But oh my, how dangerous it was. Nice runoff eh? It was certainly a great era for racing in F1 and all around the world. Low budget, highly competitive, great tracks, and really a ton of fun: what racing should be! Drivers went onto F1 from Atlantic back then and everyone knows the stories of how Villenueve measured his bravery against these tooth-cut drivers from North America. But also, that lifestyle is where my parents found romance and where I ultimately came from. They would pack up their bus and head across North America and Canada racing during the summer, James was racing and Barb was trusty with a stop watch. My mom, Barbera, would have been 61 on Friday, August 6th, and even though she became a very successful jewelry artist later in life, and my Dad finally won the championship in Formula Atlantic 1982 (in the year I was born, he shared the St Pete podium with a young Paul Tracy), it's just cool to look back at our racing roots. Hey look, racing were people actually raced each other rather then running them into the grass or walls when they try to overtake! Sportsman like racing, whats that? I have a personal rule to never watch anything with jazz flute. I'm glad I forewent that rule this time. Gotta love some vintage Formula Atlantic! @Jonathan: That's because it's a club sport. If you want sportsman-like behavior, good times, and fun memories club sports are awesome! It's got the whole collective/community feel, everyone is there to have fun. Any of you guys that race Summit Point notice Bill Scott on the pit wall? Just think, here you are climbing into a tub of fuel in a race track FAR FAR away from the 'Ring where you just heard (not even watched cause there was no Internet) about Niki Lauda nearly getting killed. Just imagine the bravery / stupidity? There wasn't room for douches' cause all the drivers didn't punt each other, they raced cleanly but hard. Not Schumacher hard, but Hunt/Lauda/Prost/Kimi hard.